Guangzhou Trumpchi GS5-BEV Pure Electric Vehicle Concept. Yeah, that's a mouthful. 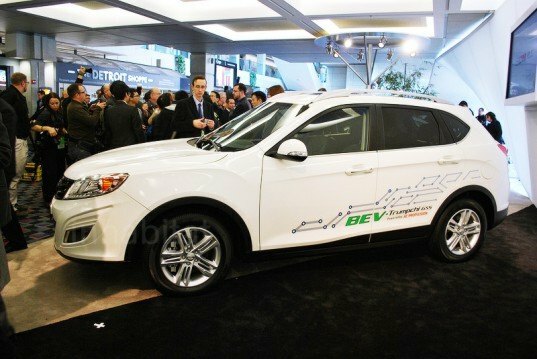 Chinese automaker Guangzhou Automobile Group brought this pile of letters and numbers to the 2013 Detroit Auto Show, to show off its all-electric drivetrain in a performance-oriented SUV body. The Trumpchi GS5-BEV Pure Electric Vehicle Concept is based on last year's ICE Trumpchi GS5 SUV revealed in March, but features 200 horsepower, 2-hour charging, and bi-directional power capability. According to the company, "Vehicle-to-Grid (V2G), Vehicle-to-House (V2H) and Vehicle-to-Vehicle (V2V) power flow are all possible." This system is mounted low in the vehicle for better stability and promises a 100-mile range. We love the idea of bi-directional house-vehicle charging, which seems to be an increasingly popular concept among automakers who realize the potential advantages of using a vehicle as a house or equipment generator. The looks of the Trumpchi GS5-BEV are also better than we expected, given the low bar set at previous auto shows by other Chinese automakers such as Geely. 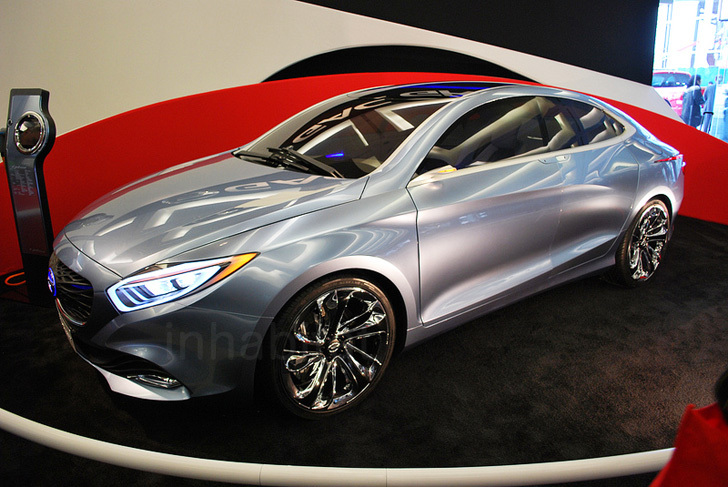 Guangzhou actually brought three green models to show off, including its GS5-BEV, the 4WD Trumpchi Hybrid sedan, and the E-jet Concept Extended-Range electric car. The company was a little light on details for these cars, but we love the look of the E-jet concept, which promises a 0-60 time of 4.5 seconds. We love the idea of bi-directional house-vehicle charging, which seems to be an increasingly popular concept among automakers who realize the potential advantages of using a vehicle as a house or equipment generator. The looks of the Trumpchi GS5-BEV are also better than we expected, given the low bar set at previous auto shows by other Chinese automakers such as Geely. Guangzhou actually brought three green models to show off, including its GS5-BEV, the 4WD Trumpchi Hybrid sedan, and the E-jet Concept Extended-Range electric car. The company was a little light on details for these cars, but we love the look of the E-jet concept, which promises a 0-60 time of 4.5 seconds.